September hails the start of Fashion weeks around the globe and also on the national front, with L'Oreal Paris Bridal Week taking place in Lahore, Pakistan from 16-18 September. International trends for Spring/Summer 2016 are making waves at the New York Fashion Week in NYC from 10-17 September. Then there is London Fashion Week from 18-22 September followed by Milan Fashion Week from 23-29 September. The month will end on a high note for fashion with Paris Fashion Week commencing from 30 September and lasting up till 7 October. Anyone who loves fashion can't help but get caught up in the excitement of fashion that is taking the international arena by storm. 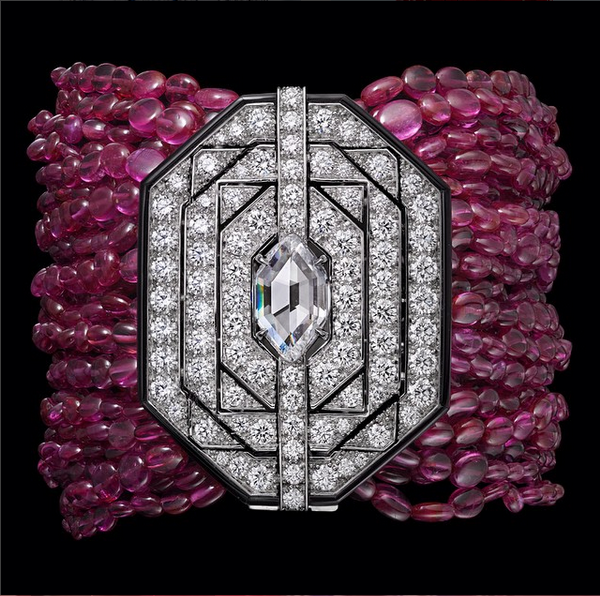 I have also been tickled by the fashion muse into blogging about some sophisticated style. However instead of discussing SS 2016 trends, I decided to do a more practical and time appropriate fashion blog. This is a time when there are loads of weddings going on in Pakistan, especially as we approach the cooler months. Hence I decided to do a fun fashion blog about how you can make a glamorous and sophisticated fashion statement at a wedding soiree. I will start putting the look together with the outfit. The cloth material that is the most popular these past few months has been Organza. The designer whose outfit I chose is Saira Rizwan. Saira Rizwan is not as well known or established as some of the other Pakistani brands, but her clothes have won her a pretty sturdy fan base. She started initially working for Karma in 2004 then ventured out to start her own brand in 2007. 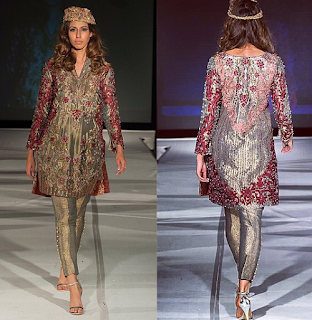 The outfit I chose is shown below, and is from her mid 2015 Bridal Collection titled 'Gul Mohar'. A picture showcasing the front and back during the fashion show is also given below to get an overall idea of the ensemble. Though there is a fad of wearing embroidered light jackets at wedding functions, I prefer this short shirt with straight pants style in hotter weather. Jacket style is more suited for winters where a layered look is not only fashionable but also practical. Now for my favorite bit, the accessorizing. I always love accessorizing, for me it is actually more fun than choosing the outfit itself. Let's start from the top. A hair updo would look sophisticated and leave you feeling cooler during these hot summer months. 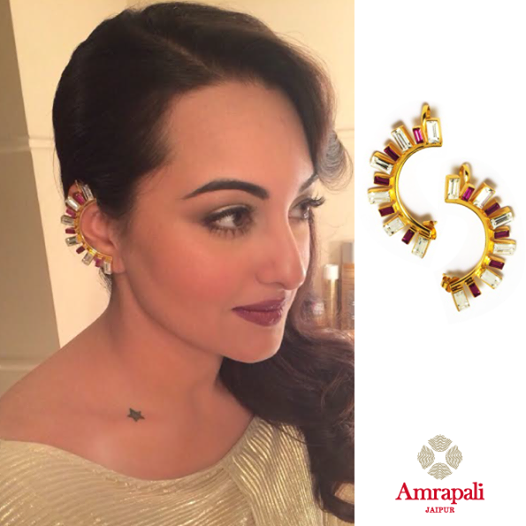 For the earrings, I would choose these very trendy and chic ear cuffs by Amrapali Jewels from Jaipur, India. A well established brand in India, it is also being launched in Pakistan soon. With the hair in a simple, classic up-do, these would be very visible and make a great fashion statement. The picture below was taken from the Instagram page of Amrapali Jewels and shows the earcuffs being modeled on a woman. Every fashionista has heard about Christian Louboutin. Famous for their trademark red soles and stunning designs, Christian Louboutin shoes have adorned the feet many fashionable women in the world. For this look, however I will choose the Christian Louboutin Lipstick, which have just been launched this very month, September 2015. With three different textures (Velvet Matte, Silky Satin and Sheer Voile) and 38 shades, along with a bullet amulet design which doubles as a necklace, these are as iconic as lipstick gets. For this particular look, I would suggest using Rouge Louboutin in Silky Satin texture. 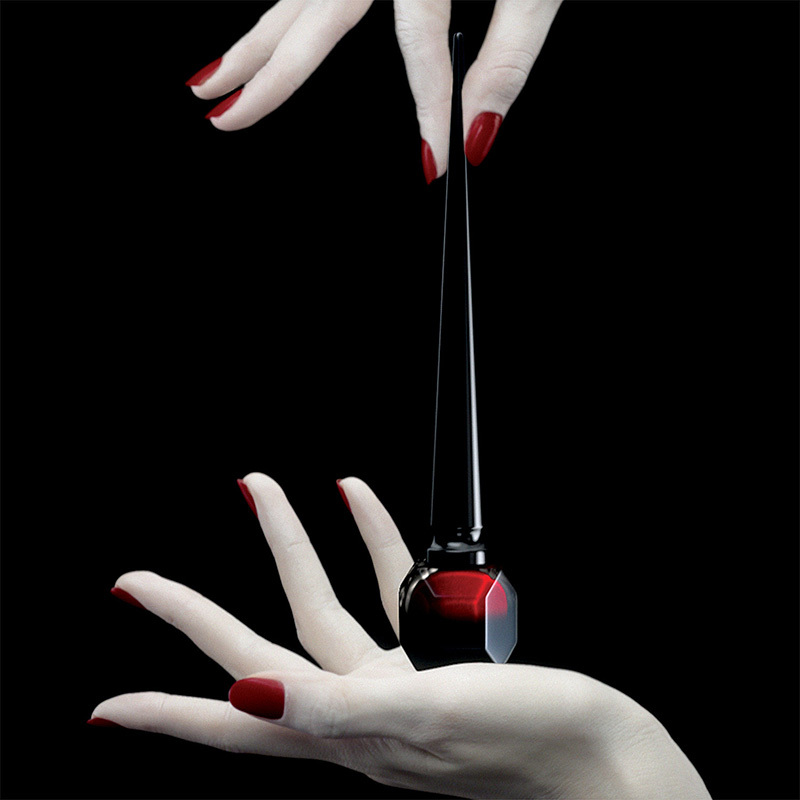 Since we are talking about Christian Louboutin beauty, I would also suggest using their Rouge Louboutin shade on beautifully manicured hands. 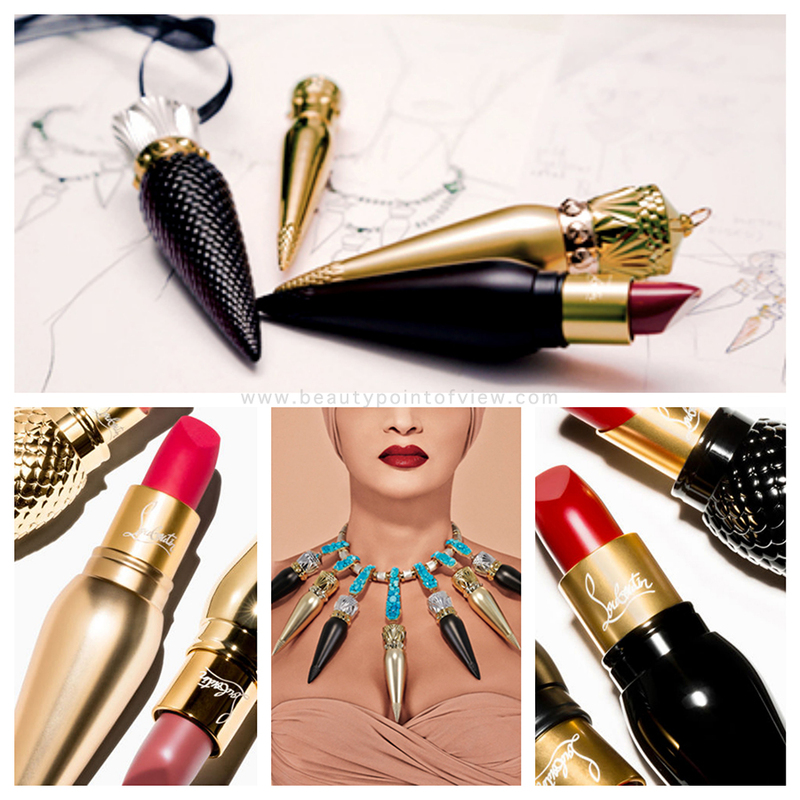 The color 'Rouge Louboutin' is a highly pigmented and glossy shade of red. When it comes to shoes, Manolo Blahnik is another name whose shoes have enchanted fashionistas around the globe. Manolo Blahnik has also forayed into a new department different from shoes, launching his new bag line in end July 2015. Capitalizing his love for ornaments and jewels which is apparent on his shoes, he has created six beautiful classy clutches in satin adorned with shiny embellishments. These are quite similar to some of the most popular Manolo Blahnik shoes, so paired together they would look gorgeous also. 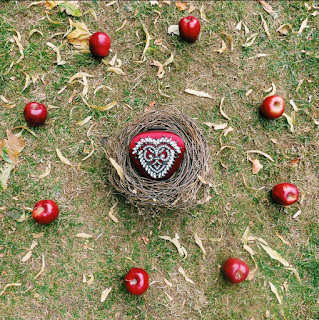 For this particular look, I have selected the new deep red Manolo Blahnik Okka clutch pictured nested in the artistic capture below. 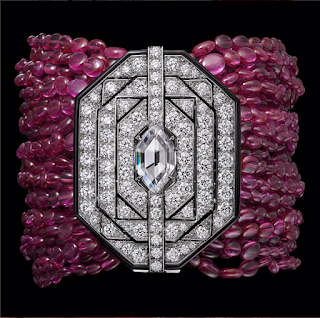 Adding this dazzling Ruby and Diamond geometric bracelet by luxury brand Cartier would add the perfect bling factor. 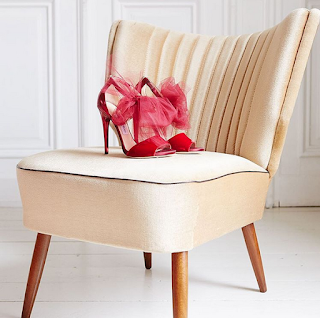 To complete the look, I have chosen red Lilyth stilletos, with its gorgeous red tulle bow, from iconic shoe brand Jimmy Choo's Autumn Winter 2015 collection. The red tulle bow would look really beautiful under the pistachio green straight pants of the outfit. You now have the complete look. 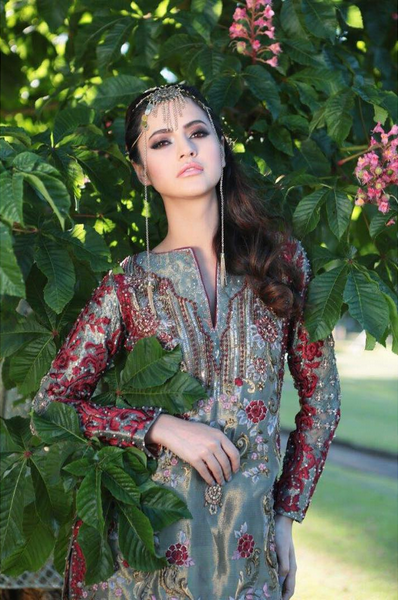 The gorgeous pistachio green outfit in shimmery organza accented with deep red flower embroidery and sequins, along with contrasting red accessories will enable you to make a fashion statement and guarantee you enjoy any wedding reception in sophisticated style. Just finish it off with the most important accessory of all: A Smile, and you are good to go. great collection madam, i wish there could be trusted sites for online shopping in pakistan. Anyways, keep up the good work sir. I found fascinating stuff in your website especially its conversation. By the heaps of comments about the own articles, I figure I am not the just person using of the pleasure! Keep the good work up out.